Here the sender information, permissions and the coverpage of the user are defined. This is the number that appears in the header of the fax being sent. This is usually an extension. This is then combined with the Sender ID of the ixi-UMS Business. This is the "Calling Party Number", which is signaled for outgoing UMS messages for this user to the telephone system. You only need to enter something here if the ISDN (D-channel) information must be different from the entered fax sender number. This is not the "sender ID" that is printed in the headers of the fax message. If nothing is entered here, the cover page selected on the ixi-UMS Business server is taken. Only if the user is to have an individual cover (different from the one defined in the server), specify the directory name of the coverpage subdirectory. This allows you to set how far a user may send fax messages. If you select "System Settings", the default permission set at the ixi-UMS Business server is valid. 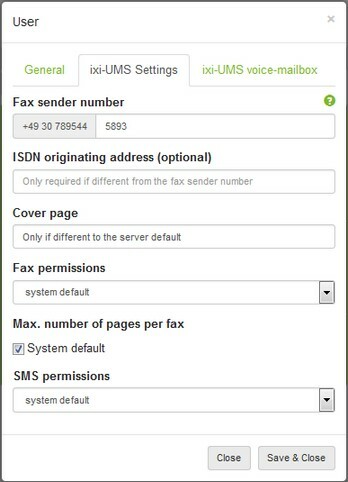 You can set the maximum number of pages per fax in Outbound fax messages in the ixi-UMS Business server configuration. If the user wants to send a fax with more than the number of pages specified on the server, he receives an error message. If System default is selected for the user, the default is valid. Remove the check box to give the user an individual number of pages per fax. This can be used to set how far a user may send SMS messages. If you select "System Settings", the default permission set at the ixi-UMS Business server in "SMS Setting" is valid.